Eric Baker started Harvest skis in 2015 in Steamboat Springs, Colorado USA after taking a course in ski and snowboard design at Colorado Mountain College, and focused on locally-sourced wood for his core laminations. He emphasizes grass-roots support and small-business development for Harvest Skis as an ecologically-sensitive community member, supporting his products with a highly unusual 3 year warranty. "The Root Down is the all mountain mid-fat free skiers dream. A twin tip design, with a do-it-all mentality – fresh snow, corduroy, steeps, trees and hot laps in the park are all in a day’s work for this all around ripper. Design Features: Early rise tip and tail for increased float and turn release, camber underfoot provides edge hold on firmer snow and a medium flex for a playful but solid feel." Two layers Vector Ply 22oz. tri-axial weave fiber glass. PBT high gloss L15 Carbon textured topsheets with sublimated graphics. 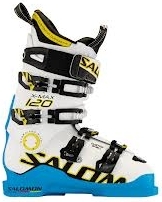 Salomon Quest Access 60 boots. Very nice, clean fit and finish with a distinctive textured topsheet hosting vibrant, handsome graphics. Moderate rocker at tip and tail, moderate camber underfoot. Soft flex as you go from either end to the center underfoot...moderate flex underfoot. Modern shaping and camber profiles. Striking graphic color scheme. Hand-flex and "gong test" shows a nicely damp, yet energetic rebound. Moderate-to-soft torsional flex response. Fun and clean looking. Total strangers on the lifts remarked how much they liked the graphics. Eastern corduroy, packed powder, shin-deep and knee-deep dry powder, bumps in a variety of surface conditions, hardpack groomers & boilerplate. The Harvest Root Downs are some of the most fun, playful and effective twin tips we've seen in a long time. The balance between the rockered tip and tail profiles, camber underfoot, rebound energy and sidecut geometry creates a super-effective, super-fun mischief-maker of a ski with effortless agility and carefree handling all over the frontside of a resort. While biased toward the soft-side of the flex spectrum for lighter skiers who lap the park in-between woods adventures and open-terrain ripping, the Root Downs would also be a great choice for recreational skiers of all ages looking for an easy-handling, lightweight twintip ski with decent security underfoot. The easy-handling, sporty-feeling Root Downs ski shorter than they measure due to the significant rocker front and rear, and you can feel the short running length getting a bit nervous and loose above moderate speeds, but a quick and easy scrub sideways gets your speed back down to their comfort zone without any fuss. Hardpack performance is pretty good for a ski of this design, yet remains on the loose side rather than the on-edge slot-car feel you can get with more carving-oriented skis. Harvest wanted to create an all-around, do-it-all ski, and the Root Downs nail the do-it-all twintip category with a slight bias toward soft and fun rather than stout and burly. The Root Downs became nearly impossible to pry away from our 15 year-old tester who loves trees, speed-runs, jumps and park features (becoming her go-to ski for nearly every condition every day except boilerplate carving days), yet made an adult totally happy noodling all over the mountain, prompting exploration and adventurous behavior more than most other skis would...you get the idea. The Harvest Root Downs are firmly planted in the somewhat softer side of the flex spectrum, with a compliant torsional strength, so they prefer quick bites underfoot into hardpack surfaces rather than deeply-trenched, GS arcs at speed, but they provide a confident grip when you need it, as long as the pressure level and speeds are moderate. If you overpower the Root Downs on boilerplate surfaces, they will yield and wash away a bit, but regain their composure if you settle down and apply moderate pressure at moderate edging angles directly underfoot. Like so many rockered twintips, the rockered tip and tail provide a short running edge length, so plan your turns accordingly. Directional changes on hardpack are easy, as long as you treat them like rockered twintips instead of race skis. Vibration control on rock-hard surfaces is remarkably good, isolating the buzz underfoot, while retaining a nice feel for the surface. The VDS rubber in Harvest's design works well to damplen vibrations without deadening the ski's sporty response and feedback. Blasting through mixed snow conditions and cut-up mid-day powder is totally fun and easy with the Root Downs. The moderately rockered tip and tail profiles work really well with the flex of the chassis to deliver a really responsive, agile and compliant ride through mixed conditions. There can be an occasional feeling of deflection under the surface, but it's more of a feeling than actual deflection of your trajectory off-line. The soft tip absorbs the hits and may twist a bit, but once your pressure zone in the midbody of the ski encounters the terrain that torqued the shovel a bit, you remain on-line and tracking where you pointed the skis in the first place. The rockered, rounded tail never hangs up, letting you swivel, pop, crank or smear your way through whatever junk is in your way. Agility level is very high and directional changes are pretty effortless. The soft flex of the ski and its short effective length mean you can feel a little unsettled at high speeds as you crank across mixed surface conditions. There can be a slightly "flappy" feel to the Root Downs if you get into higher warp factors, but you can quickly check your speed back into the comfort zone without feeling any loss of control. People may want to consider buying the Root Downs a size longer than usual to get a more stable platform for crud-surfing antics. Bumps are easy and fun with a compliant and easy front-end, poppy and grippy midsection with a no-hangup, energetic tail. Serious bump addicts might find the Root Downs to be a little soft for thrashing, hard-core bump runs, but 90% of all-mountain skiers wanting a fun twintip will find themselves venturing through the bumps more than they might expect. Harvest's Root Downs work really well for freestyle twintips in powder conditions, even thought they're only 90mm underfoot. The rockered tip and tail give a great surfy feel, and you can bank your turns or smear them equally well without much effort. The underfoot camber doesn't penalize the Root Downs in powder conditions, so they remain fun and easy playthings when conditions are fluffy. They rise up and get to planing condition quickly, and make excellent tree-noodlers. Higher speeds in wide-open powder fields show the Root Downs ski very short at speed, and you might find yourself wanting a bigger platform for high-speed runs through the freshies in big terrain. The Root Downs really like tight tree skiing in powder and do it with less effort than most 90mm-waisted skis in this category. Just keep your speed expectations in check. Harvest has nailed the twintip design really well with the Root Down model, making turn initiation effortless, both in on-edge mode and flat-ski pivot mode, thanks to the rocker proportions, camber length and position along the body of the skis. The short effective edge length means the rockered tip and tail swing away in either direction easily without interference, with a concentration of pressure and grip underfoot in the cambered section for security. The turn shape is easily variable as you progress through intiation to apex and finish, delivering a nicely rounded arc without abrubt interruptions or hitches along the way. We had a great time arcing the Root Downs into various size turns with the same smooth shape, just altering the pressure level and hold-time to get the radius we wanted. You can ski the Root Downs in lazy-mode, or deliberatly arc your way around low or high-angle terrain with a remarkably low level of effort. Freestyle antics need a tool to deliver lots of different turns in different situations, and the Root Downs deliver nicely. Boilerplate surfaces reveal the Root Downs can be a little insecure in their hardpack turn prowess, preferring to be kept at moderate edge angles with moderate pressures rather than driven hard into carving mode where they can lose some composure, resulting in some drift instead of grip. This feeling disappears immediately if the surface is less than rock-hard. We mounted on-the-mark, and found we liked Harvest's recommended mount position unless we wanted some more high-speed stability, where -1cm or even -2cm worked pretty well. We kept returning to the original mounting position for best twin-tip instant handling in nearly all conditions. A happy, bouncy funhouse or 1-year-old bird dog eager and willing to run around and go anywhere for a good time, always delivering smiles no matter where you end up. They hold up really well on the groomers, even at speeds. The tails don’t wash out and betray me while I carved the way I was expecting a rockered ski like this one to do. I did have to get a little more forward and lean into it harder than I typically do in order to get up to speed, perhaps because of how short the from half is? Once again, excellent on some of the un-groomed trails in a few inches of powder. These skis were super stable and they have a really sweet turn when there is something for them to dig into. That being said, ice isn’t exactly their friend. I found myself side slipping unintentionally a few times on some of the more icy scraped off areas, nothing out of control, but I was definitely not able to move as freely as I would have liked to. As long as I hit the ice with enough momentum, and kept straight they felt solid under me, but if I hesitated or attempted to turn them without really putting the edges in they sort of fell away. So good. These skis take off really smoothly, and don’t get hung up on the lip of the jumps the way I’ve felt some skis do. They were especially strong on the landings, I was able to send it off some of the jumps and hit the ground running. They absorb the shock really well, which surprised me again because of how short they are. " Energetic and poppy, seems to crave exploring features and fun stuff. 3 Year warranty??? What??? Wow. Nothing, other than maybe offer a stiffer version for heavier skiers. The Root Downs are a great example of a modern twintip design with a spot-on balance of flex, camber, rocker and turn geometry in a super-easy, fun and sporty package. The addition of a 3 year warranty makes Harvest a really compelling ski company. Buy this ski one size up for most all-mountain usage. Anyone looking for a playful twintip park ski with all-mountain credentials will like the Root Downs. It is probably one of the best youth-oriented twintips we've seen in a long time with great behavior outside the park and pipe. Heavyweights or musclehead skiers will overpower the Root Downs. This is not a ski for people who want a carving-oriented all-mountain tool. Not only would the Root Downs be great for teenage skiers all over the spectrum, but they would also make many older or less advanced skiers really happy who don't want a carving-oriented all-mountain ski. Don't be afraid to buy the Root Downs one size up since their effective edge is relatively short due to the rockered tip and tail. Consider asking Harvest to stiffen the ski slightly if you tend to be on the heavier side of the spectrum.